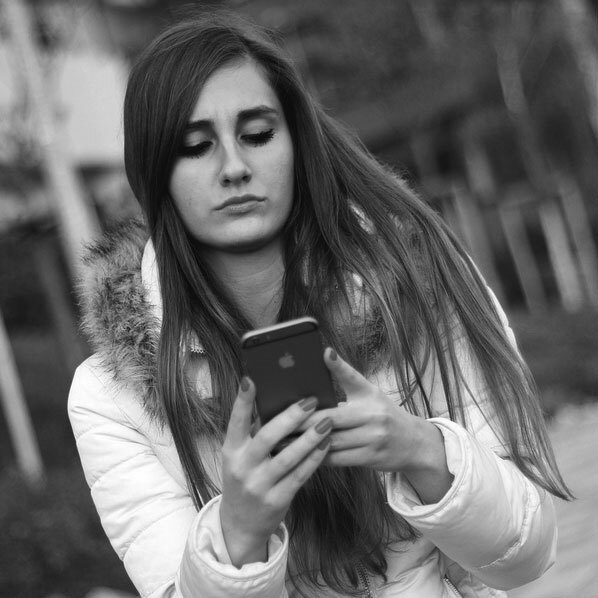 Customer spends $1,000 to complain – Social media has given Customers a power they’ve never had before (past eService The Biggest influence on Customer service); however, one Customer’s service rage hit new levels. British Airways lost Hasan Syed’s luggage and was slow to respond. Big mistake! Syed took to Twitter, but he didn’t just tweet his frustration. Instead of just tweeting, Syed, who uses the Twitter handle @HVSVN, spent $1,000 buying promoted tweets in the New York and U.K. markets, using Twitter’s self-serve ad platform. Service Rage – Syed used the same technique that companies use to blitz consumers with their marketing and advertisements; however, he reversed this platform and used it to blast British Airways. His tweet, “Don’t fly @British_Airways. Their Customer service is horrendous,” was aimed at people who follow the British Airways account on Twitter. It didn’t take too long until it went viral, and Syed’s brand assassination was picked up by numerous sources including CNN & BBC. Who Will Be Next? Mr. Syed did finally get his luggage back and British Airways issued a statement apologizing to him. However, every business should be on alert that Customers will go to any length to get even if they feel you or your company failed to deliver what you promised and are not willing to make it right (see Zero Risk). Be the Best at What Matters Most – Today too many of us are trying to be super human or super companies, trying to be excellent at nearly everything, and as a result of this ambitious plan, we end being average at most. Steve Jobs was a master at simplicity, from his products to his strategy (eService on Steve Jobs). There are only a few people ever born, and even fewer businesses, that are capable of being extraordinary in numerous areas. That is why best-selling author and business expert, Joe Calloway’s, new book, Be Best at What Matters Most (Wiley & Sons 2013) is so timely. Who are you? You don’t answer that question, your Customers do. What do people think when they hear your name or your company’s name? That is what this book is about: being great and making an impact at what you were born to do, finding what your purpose is, and doing it better than anyone else. This is a concept I live by. I have built two businesses around this philosophy. Be great at one thing, know what that one thing is and do not deviate from that one thing. Take for example The DiJulius Group. What do you think of when you think of TDG? Customer service consulting. TDG is a one-trick pony and we are proud of it. We turn down business opportunities every week from companies looking for sales training, motivational presentations, or any other inquiries we get that fall outside of what we do. However, we are the best at what matters most to our clients — Customer service. 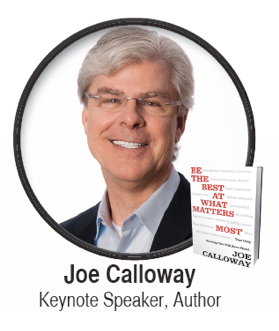 Joe Calloway interview – In my interview with Joe Calloway, we discuss his book, Be the Best at What Matters Most. Joe explains the need for quality and consistency. Today’s busy pace and need to multi-task often leads us to spend too much time on things that ultimately are not very important. Spreading ourselves too thin is all too common. Joe’s concept helps us find clarity on what is most important to our business. Joe also talks about how the need to simplify allows you to achieve greater results. Watch the entire 20-minute video interview with Joe Calloway. Super Joe – Joe Calloway is a leading performance expert who helps great companies get even better. He helps organizations focus on what is truly important, inspires constant improvement, and motivates people to immediate action. Joe has been a business author, coach, and speaker for 30 years and his client list reads like an international “Who’s Who” in business, including a range of companies from Coca Cola and IBM to Saks Fifth Avenue and American Express. He’s back and better than ever – Joe keynoted at the 2009 Secret Service Summit and remains one of the highest rated speakers we have ever had at the summit. Due to his recently published, Be the Best at What Matters Most, we decided it was the ideal time to bring Joe back to speak at the 2013 Secret Service Summit in Cleveland November 4th & 5th. 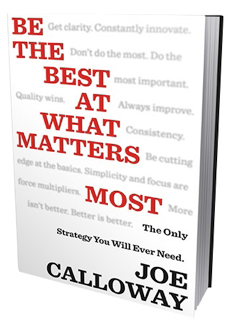 Get your FREE copy of Be the Best at What Matters Most – EVERY attendee to this year’s Secret Service Summit will receive a copy of Joe’s new book Be the Best at What Matters Most.